Our fathers and ourselves sowed dragon’s teeth. These days, Stephen Vincent Benét is remembered, when he’s remembered at all, as the author of modern tall tales like The Devil and Daniel Webster, the epic Civil War ode John Brown’s Body or his reams of sentimental young adventure stories. Much of his other work is out of print. That’s a shame, because after 1935, spurred by fascism, war and depression (his own as well as the country’s) Benét produced a series of brilliantly haunting works, both poetry and fiction. These oft-apocalyptic visions — which he did not hesitate to label nightmares — laid the groundwork for what we often expect the End to look like. Anytime a fictional future humanity looks out over the ruins of familiar landmarks, sees the birthrate tank or gets betrayed by its machines, there’s a debt owed to Benét. Benét was, for most of his career, just about the most mainstream writer one could imagine. 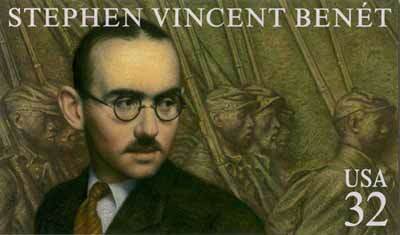 Coming from an upper class military family, he was the student star of Yale’s literary circles. Both his poetry and adventure stories sold well. In 1928, John Brown’s Body won a Pullitzer. He became one of those rare writers to enjoy both critical and popular success in his own lifetime. But the world was changing, and not for the better. The Roaring ’20s came crashing down, fascism began its bloody march and, facing his own personal and mental issues, Benét began to see visions far different from his previous works. Others may have seen temporary difficulties or descended into revelry, Benét saw the abyss opening. But his mask was the blind mask of Ares, snouted for gas masks. He was neither soldier, sailor, farmer, dictator nor munitions manufacturer. “You will not be saved by General Motors or the pre-fabricated house. You will not be saved by dialectical materialism or the Lambeth Conference. You will not be saved by Vitamin D or the expanding universe. While Benét’s older work showed undeniable skill and occasional power, it often remained hindered by the tropes of the day and an occasionally nigh-sickening degree of sentimentalism. 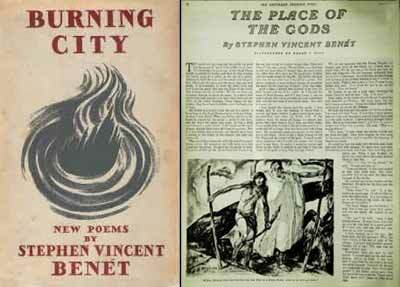 While he cranked out plenty of that stuff still, his visions took center-stage in 1936’s Burning City, which includes of slew of “Nightmare” poems like the one above, as well as other works suffused with the same sense of the impending end, such as the aforementioned “Litany” (his masterpiece, for my money). This was different. 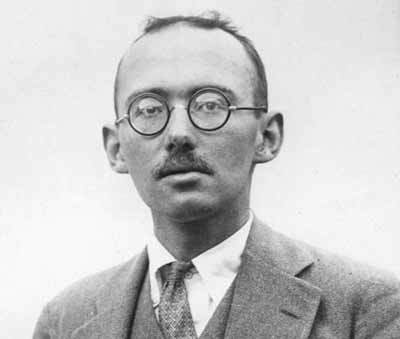 With each of the poems — and the similarly themed stories that came afterwards, Benét tapped into primal fears about tomorrow — fears that have only grown more prescient in the years since his death (heart failure, in 1943). Nightmare Number Three envisioned a bloody, black humor revolt by all of mankind’s machinery, with the nameless narrator huddled in mad fear, speculating on how things could have gone so wrong (“letting six million people live in a town./ I guess it was that. I guess they got tired of us./ And the whole smell of human hands.”). Eerily enough, “Metropolitan Nightmare” even foresaw a hideously warming world — this was the mid-1930s, remember — “It was too hot,/ Too hot to protest, too hot to get excited./ An even, African heat, lush, fertile and steamy./ That soaked into bone and mind and never once broke.” Though I’ve yet to hear scientists discover that, as in Benét’s vision, the termites have started eating steel, but one never knows what tomorrow may hold. There was also the shattered image of a man or god. It had been made of white stone and he wore his hair tied back like a woman’s. His name was ASHING, as I read on the cracked half of a stone. I thought it wise to pray to ASHING, though I do not know that god. How shall I tell what I saw? There was no smell of man left, on stone or metal. Sadly, this side of Benét’s work has mostly fallen out of print and his name no longer holds the fame it once did. “Litany” and some of the nightmare poems will occasionally turn up in anthologies, and “By the Waters of Babylon” was reprinted in the late ’80s. In general, however, Benét has gone down in popular imagination as the guy who wrote that civil war poem and some amusing tall tales. But if you’re rooting around a used bookstore one day, look for a yellowed volume of his work tucked back on some dusty shelf. The world moves on — but the best nightmares never grow old. man, i’ve been trying the audio all day and it’s not working…! i really want to hear this. what’s the title of the recording and where can you find it? Joshua, hang in there; I will fix it in just one sec. Thank you. His work is so underappreciated, and so is this wonderful article. Thank you so much, David. What a treat to listen to that old radio show! Just now finding this, mate. Good stuff! It’s amazing what net archaeology digs up. There’s a smattering of media I’ve consumed just this past year that owes him quite ze debt. Und I’d never even heard his name so much as whispered. Once again, good job D.
Jerem, Mer: Thank you. I first encountered “Litany” in an anthology when I was 15 and found it pretty bracing stuff (still do, ten years later) and sought out his writing since then whenever I could find it. There’s an interesting lesson, I think, in how Benet’s been remembered. Some of his most brilliant and innovative work has left a definite imprint, but is now barely remembered. It’s funny what time will do to how an artist’s work is perceived. Nadya: Danke. I’m really glad everyone got to hear it. It adds a fascinating dimension to his work. Alice: I think we’re in a turbulent time on about every front, and apocalypses tend to flourish in such eras. I’m glad you found the piece fascinating, as Benet birthed some great modern ones. beautiful. thank you. i have already gone to amazon and ordered a copy of this book. Misty: Thank you, that made my evening. Just found this while looking for the poem “Nightmare Number Three” which has haunted me since college. Really well written and a wonderful overview on a forgotten man of American letters. Thank you. With regard to “Metropolitan Nightmare” the green parrot colonies have been nesting in Brooklyn for at least 20 years, and for the last 5 years pelicans have begun nesting in the Long Island tidal marshes.